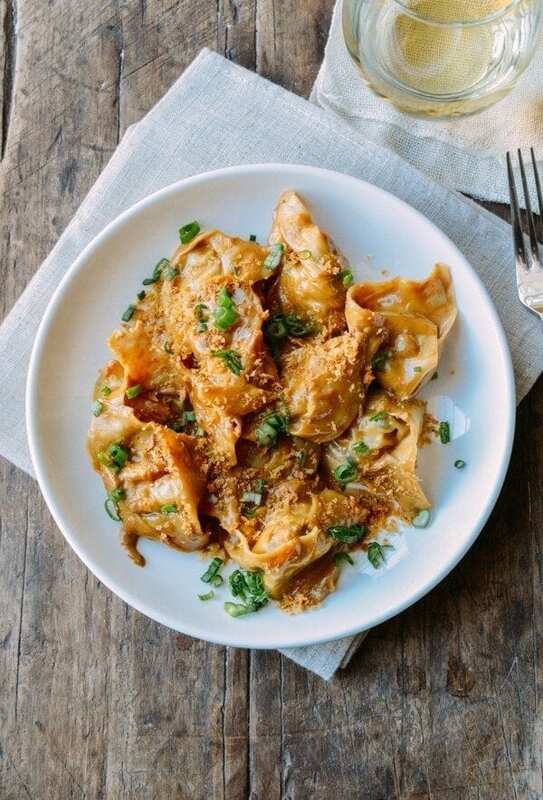 This Shiitake mushroom tortellini recipe with soy cream sauce has an amazing filling of mushrooms, ricotta, and scallions. It's a wonton/tortellini fusion mash-up. In a skillet over medium high heat, add a few good lugs of olive oil. Add the mushrooms and season with salt. Sauté the mushrooms until tender and caramelized. This could take a while, so don’t rush the process! Once the mushrooms are caramelized, you might have some sticky bits at the bottom of the pan. Deglaze with a bit of water. Transfer the cooked mushrooms to a mixing bowl and add the scallion, crushed red pepper flake, Parmesan, ricotta cheese, egg, and salt and pepper to taste. To assemble, use a bit of water to dampen the edges of each wonton wrapper, and add a teaspoon of filling to the middle. Fold in half diagonally so you get a triangle. Make sure there aren’t any air bubbles in the middle, and that the edges are tightly sealed. Bring the two farthest corners of the triangle together to make a pseudo “tortellini” shape. Continue assembling until you’ve run out of filling. Bring a pot of water to a boil for the tortellini. In a skillet over medium heat, add a couple tablespoons of olive oil. Add the panko and stir constantly until golden. Remove from the pan and set aside. Add a couple tablespoons more oil to the skillet and add the garlic. Cook for 1 minute. Add the milk and cream, and bring to a simmer. Cook for 2 minutes and add the soy sauces. Season with pepper. By now, the water for the ravioli should be boiling. Cook the ravioli in the boiling water for 20 seconds. With a slotted spoon, transfer the ravioli to the sauce and simmer for another 60-90 seconds. Serve immediately, garnished with your panko pangrittata and more scallions.